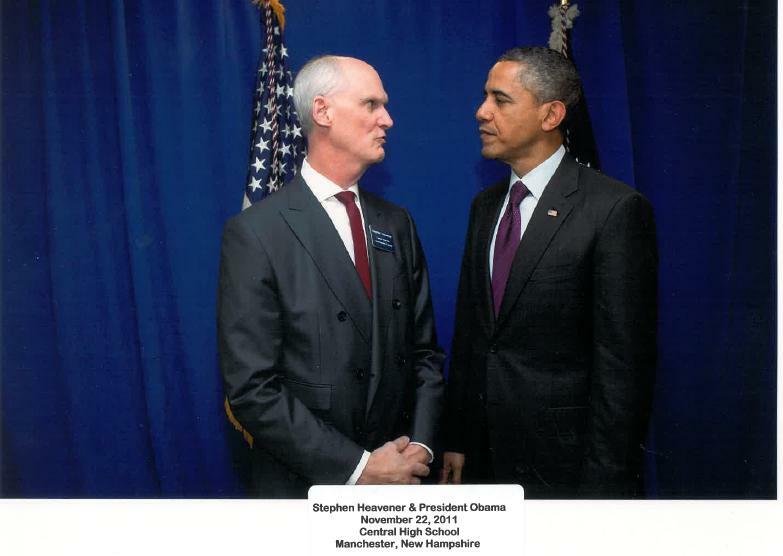 While visiting New Hampshire on November 22nd, President Barack Obama delivered an address at Central High School in Manchester, NH, and I was invited along with almost 35 other New Hampshire leaders, to attend the speech and participate in a "meet and greet" with the President. Even though my position is non-partisan, I was deeply honored to be included in this exclusive group, which included Mayor Jim Bouley, Senator Sylvia Larsen and former Congressman Paul Hodes. During the President's speech, our group was invited to stand just to the side of the stage, which was an invaluable privilege and a unique perspective. Although his speech touched on many relevant topics, the American Jobs Act was a central theme, and certainly struck home with the supporters in the crowd. As the Executive Director of the Capital Regional Development Council, the economic development outcomes from President Obama's initiatives are critical to our continued operations and success. As an added value, I was thrilled to have significant time to interact with professional colleagues, such as Jeanne Hulit, the regional administrator for the US Small Business Administration, and Curt Spalding, the regional administrator for the US Environmental Protection Agency. Immediately following the speech, President Obama and I shared a few minutes of private conversation while we waited for our photo opportunity. As an advocate for economic development services for business and local government in New Hampshire, I utilized this opening to speak with President Obama about the Capital Regional Development Council's lending programs and the need for Congress to extend the eligibility of the refinancing of existing commercial debt by the Small Business Administration 504 Program beyond the September 30th sunset. He agreed that it should be extended as part of his overall ongoing initiatives to stimulate the economy. This brief conversation is one that I will always remember fondly, both for the economic development perspective as well as the personal encounter with a respected and admired public figure. As an economic development professional who has worked in seven states over the past 30 years, I am grateful to have been present for an address so pertinent to my expertise. For the Capital Regional Development Council, President Obama's support of our lending programs to facilitate job growth and private sector investment is invaluable. Over the next year, I look forward to additional opportunities to participate in more detailed events that are relevant to my position and experience.